Find out about the concerts on the tour here. 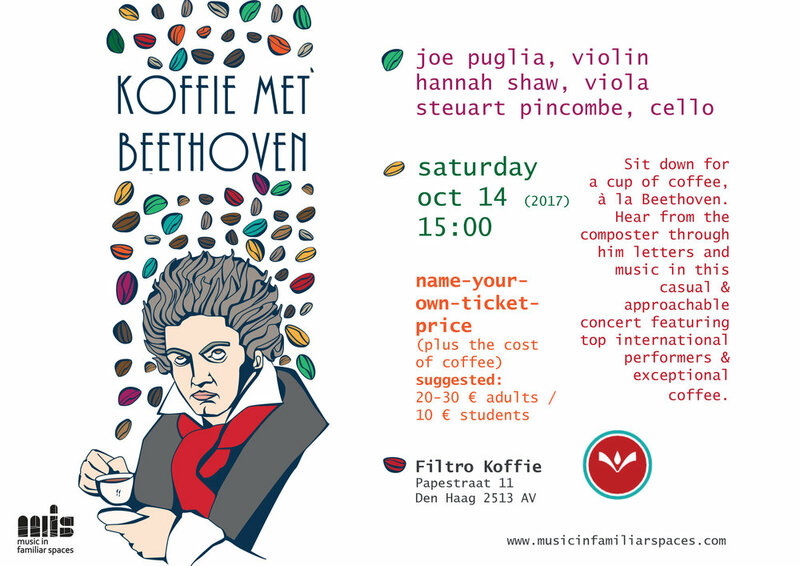 On Saturday afternoon, October 14th at 15:00 the music of Beethoven will fill the cafe Filtro Koffie in The Hague. The concert – Koffie met Beethoven – is part of Music in Familiar Spaces, a project bringing the classical music experience at its highest level into homes, cafes, breweries, bookstores, or any place where people feel comfortable. For the program’s premiere in the Netherlands, founder and cellist Steuart Pincombe is joined by two members of the Music in Familiar Spaces Artist Collective, internationally-recognized players Joe Puglia (violin) and Hannah Shaw (viola). One of the aims of the Music in Familiar Spaces project is to make classical music accessible to a wide and varied audience. This is accomplished not only by performing in familiar, comfortable and untraditional spaces, but by designing programs that allow the audience to experience the music in a new and engaging way. Koffie met Beethoven invites the audience to sit down to a cup of coffee with Beethoven, enjoying the drink as Beethoven would have fixed it himself (with exactly 60 beans), and getting to know the composer through some of his chamber music and letters. Audience members will be asked to name-their-own-ticket-price for the concert, paying what they can afford and what they deem the concert is worth (coffee is sold separately). Suggested ticket prices are 20-30 euros for adults, 10 euros for students. Seating and space is limited, so please arrive early. Violinist Joseph Puglia made his solo debut in the Amsterdam Concertgebouw as part of the 2009 Holland Festival. Reviews from the concert were overwhelmingly positive, with the headlines reading “Exceptional Debut Violinist Puglia” (NRC Handelsblad) and “Puglia Brings Hall to a Boil” (De Volkskrant). He has performed in major concert halls throughout the world, such as Carnegie Hall, Lincoln Center (New York), Queen Elizabeth Hall (London), Cite de la Musique, Salle Pleyel (Paris), and in Australia at the Melbourne International Arts Festival. After hearing a recital, cellist Anner Bylsma was moved to write of his playing “Joey Puglia is the best.” Highlights of his 2015 season include performances of concerti by Mendelssohn, Mozart, Pärt, Saariaho, Berio, Denisov, Hillborg, and van Vlijmen, numerous broadcasts on Dutch Radio 4, a CD recording of music by Luciano Berio for the Attacca label, and chamber music performances in The Netherlands, USA, France, UK, Italy, and Norway. Violist Hannah Shaw (b. 1984, South Carolina, USA) enjoys a career spanning a wide variety of musical styles. As a chamber musician, Hannah has performed throughout Europe and the US with such musicians as Liza Fershtman, Dimitri Ferschtman, Atar Arad, Elisabeth Leonskaja, Gordan Nikolic, and Michel Strauss, among others; and she appears regularly at such festivals as Open Chamber Music at Prussia Cove, Festival de Musique de Chambre à Giverny, Grachten Festival, Kneisel Hall Chamber Music Festival, and Casalmaggiore International Festival. Through her interest in contemporary music, Hannah performs regularly with the Asko|Schönberg Ensemble; has collaborated with such notable composers and conductors as Reinbert de Leeuw, Kaija Saariaho, Peter Eötvös, Heinz Holliger, Louis Andriessen, Sofia Gubaidulina, and James MacMillan; has had works written for her by Pulitzer prize winner Caroline Shaw, Victoria Cheah, and Timo Andres; and has appeared in the Acht Brücken Festival, Saariaho Festival Den Haag, Huddersfield Contemporary Music Festival, Holland Festival, Juilliard's Focus! Festival, and MoMA's Summergarden series. Hannah has also served as guest leader with a number of orchestras, including BBC National Orchestra of Wales, Residentie Orkest, and Gelders Orkest; and can regularly be heard playing with the Rotterdam Philharmonic, Nederlands Kamerorkest, and the Noord Nederlands Orkest. Hannah holds a B.M from the Oberlin Conservatory of Music and an M.M. from The Juilliard School. Steuart Pincombe's career as a cellist has brought him to leading halls and festivals across North America and Europe and he has been named by the Strad Magazine as a “superb solo cellist” and a “gorgeous player [with] perfect intonation, imaginative phrasing” by the Philadelphia Inquirer. Highlights of Steuart's recent concert seasons include being a featured soloist with Solistenensemble Kaleidoskop (DE), festival appearances with Ensemble Ausonia (BE), performing with Holland Baroque Society (NL) for King Willem Alexander of The Netherlands, appearing as soloist at the Amsterdam Cello Bienalle (NL), and co-founding Oerknal! (a contemporary music collective, NL). His concert 'Bach&Beer' was selected by the Cleveland Plain Dealer as one of the 'Top 10 Classical Events of 2014' and a concert in which he appeared as soloist with Rene Schiffer and Apollo's Fire was numbered in London's '5 Best Classical Music Moments of 2014' according to The Telegraph (UK). In 2015, Steuart toured North American for one year bringing classical music to new spaces and audiences in a project he started called Music in Familiar Spaces. He holds a BM in modern cello and a MM in viola da gamba and baroque cello from the Oberlin Conservatory of Music.